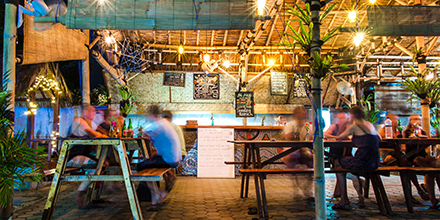 The most unique hostel on the Gilis. The hare-brained scheme of four kiwi brothers who grew up wandering the world, its grown from a conversation 3 years ago to a wonderful enterprise that we are very proud of. We’re pretty sure we’ve got accommodation to suit you – from dorms with and without en-suites to spacious private rooms – all with air conditioning! So take a look around or get in touch if you have any questions. You won’t find us on those booking sites – our aim is organic natural growth by the one thing a traveller trusts the most – Word of Mouth! But you can book with us through email. Volunteer Jay Kijai talks us through a Discover Scuba Dive with Compass Divers With more than 20 dive sites surrounding Gili Trawangan, it’s easy to understand why people come here to dive….